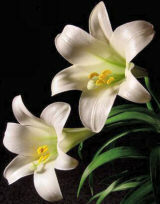 Eastertide is the time of new life. Our Savior's in the first place, living for ever a life which belongs no more to the earth and which one day we shall share with Him in heaven. And then our own lives — from Christ to us — for we have more than the assurance of rejoining Him; snatched by Him from the power of the devil we belong to Him as His by right of conquest and we share His life. Easter week is the week of the baptized. They have passed from death to life, from the darkness of sin to the life of grace in the light of Christ. Wherever there are neophytes, the Easter season, and particularly the first week, is the period of postbaptismal catechesis or mystogogy The community shares with them a deepening understanding of the paschal mystery and an ever greater assimilation of it in daily life through meditation, participation in the Eucharist, and the practice of charity. The moral requirements of the new life are recalled throughout Eastertide. They are governed by the principle enunciated by St. Paul that, risen with Christ, the Christian must raise his desires to heaven, detach himself from earthly pleasures in order to love those of heaven. It is the work of the Holy Spirit to complete the formation in the baptized of the "new man" who, by the holiness of his life, bears witness to Christ crucified. The Fifty days from Easter Sunday to Pentecost are celebrated in joyful exultation as one feast day, or better as one "great Sunday." These above all others are the days for the singing of the Alleluia. The Sundays of this season rank as the paschal Sundays and, after Easter Sunday itself, are called the Second, Third, Fourth, Fifth, Sixth, and Seventh Sundays of Easter. The period of fifty sacred days ends on Pentecost Sunday. The first eight days of the Easter Season make up the octave of Easter and are celebrated as solemnities of the Lord. On the fortieth day after Easter the Ascension is celebrated, except in places where, not being a holy day of obligation, it has been transferred to the Seventh Sunday of Easter. This solemnity directs our attention to Christ, who ascended into heaven before the eyes of his disciples, who is now seated at the right hand of the Father, invested with royal power, who is there to prepare a place for us in the kingdom of heaven; and who is destined to come again at the end of time. The weekdays after the Ascension until the Saturday before Pentecost inclusive are a preparation for the coming of the Holy Spirit, the Paraclete.